It's Monday--Picture Books Past. Thought about Beatrix Potter lately? 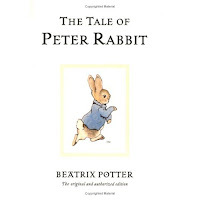 Her book, The Tale of Peter Rabbit, stands as as icon of children's literature and Peter's certainly one of the best known characters. In the story, he was "very naughty" and soon he's in mortal danger. It's an exciting story and full of vivid details. No wonder it's lasted. Her other books are a pleasure to read, too. Check out a virtual exhibit here from Princeton's Cotsen Children's Library. Visit England and learn more about Beatrix's life and her bequest to the National Trust here. Want to visit her home in the Lake District? Start planning here with the help of the Lake District National Park. And finally, did you see the movie, Miss Potter, when it came out? Check it out and be sure to watch the special features on the DVD to see a biographical film. Have a nice cup of tea, and a scone, and enjoy.